Atlantic Puffin mates are what brings these cute birds back to the nesting grounds on Bird Island in Newfoundland, Canada every year. As a pair of Atlantic Puffins stand together appearing as mates while looking out over the waters of Bonavista Bay in Newfoundland, Canada from Bird Island, two others seem to be checking each other out. If an Atlantic Puffin has to defend its nesting grounds, their feathers will puff up, their bills will open and enough calls will be made to frighten away any newcomers to the area. 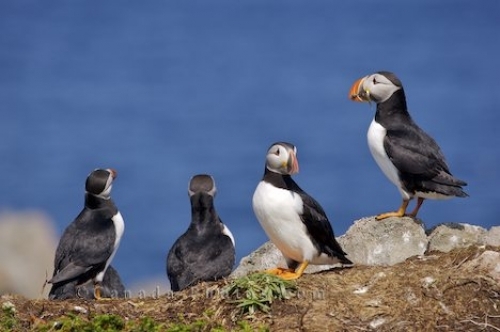 Picture of Atlantic Puffin mates on the rocky cliffs of Bird Island overlooking Bonavista Bay in Newfoundland, Canada.